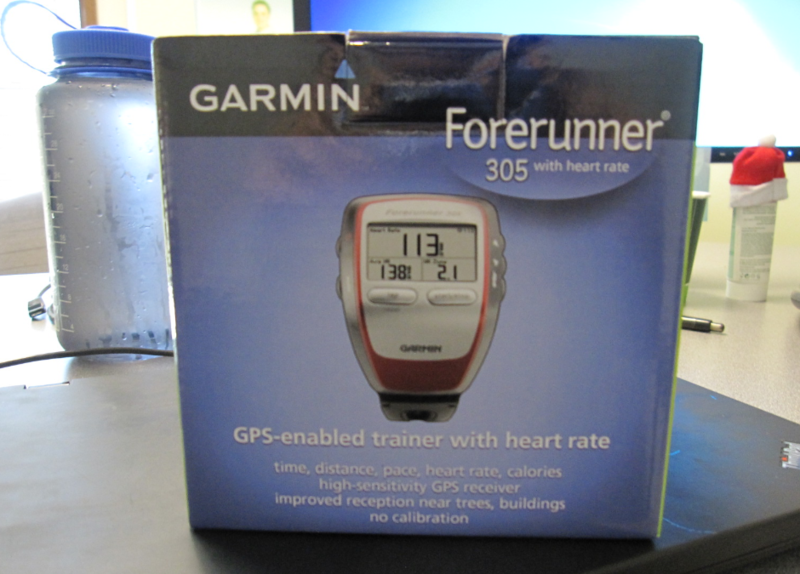 Just like all the other cool runners, I will now be sporting a Forerunner 305 GPS/heart rate monitor/watch/self-defense weapon the size of my fist. (I guess we have not fully reached the point of small form factors.) Here is proof so you know I am not exaggerating the size of this thing. It sure comes with a whole lot of stuff. You definitely get $150 worth of plastic. As soon as I power on the device, I get an error that the batter is low (good thing charging your device is the first chapter in the user manual.) I connect it to my Lenovo Windows 7 laptop, and the driver fails to install (maybe because it’s not a smart card reader.) Luckily I am able to install it manually. 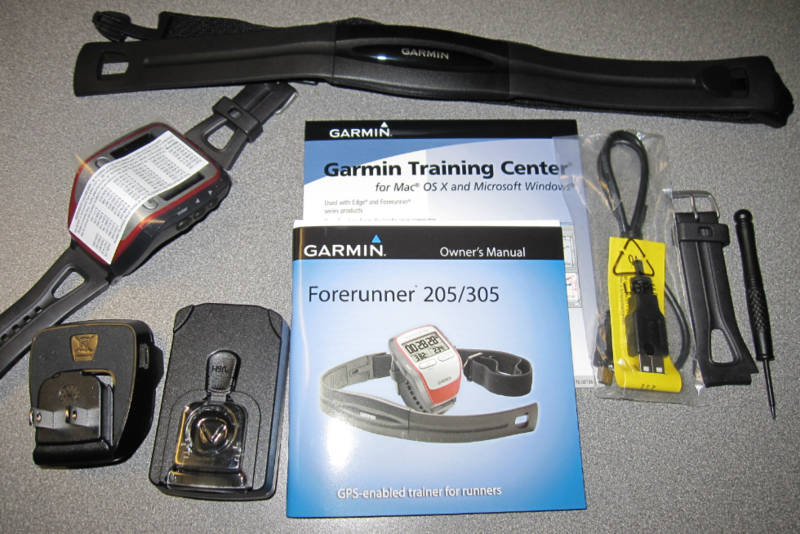 I get stuck again on the device setup question: “Do you own a Garmin cadence sensor?” I’d assume my device comes with everything already in it (why else would it be the size that it is) or is it one of the plastic thingies in the box?) After flipping through the manual and not finding anything about cadence, I choose No, and proceed to configure the user profile. After about a minute of struggling with the poorly designed buttons (my finger still hurts), I have successfully selected female, my birthdate and my current weight. Now it’s time to turn on the GPS (curious to see what it does since I am inside a building right now). 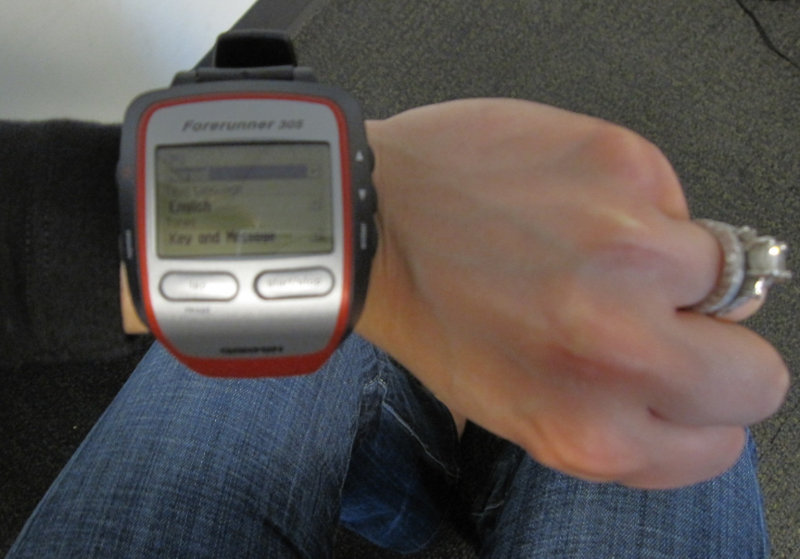 After 20 minutes I decide to rescue my Go Go Garmin from locating satellites torture (the poor thing was trying so hard but the progress bar just wasn’t nudging). My current location is set to somewhere in Africa. I sure hope the GPS works better during Sunday’s run. I was not anticipating the weather to get as warm as it did today, which is always a pleasant surprise (unless you are wearing a long sleeve black shirt like me). 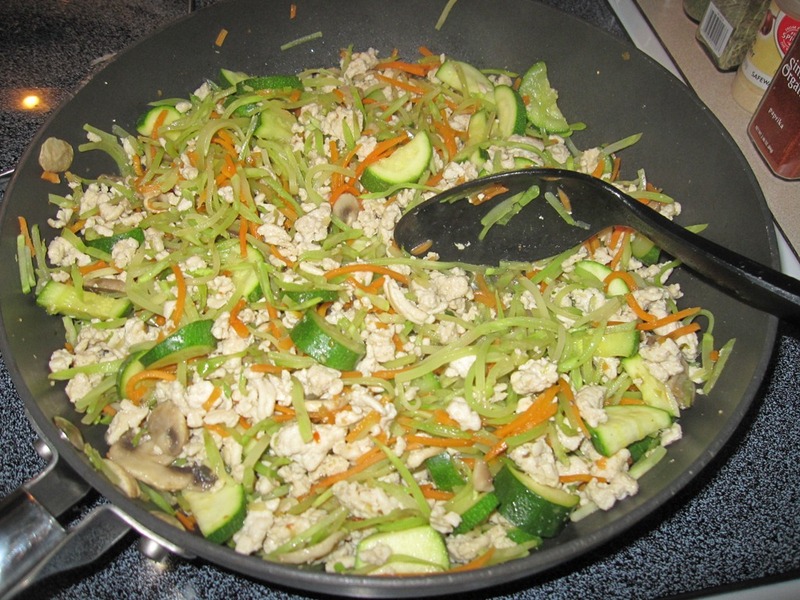 For dinner, I made Trader Joe’s Spicy Peanut Stir Fry (broccoli slaw, white mushrooms, zucchini, grated carrots, ground fat free turkey and 1/3c of spicy peanut Asian dressing). 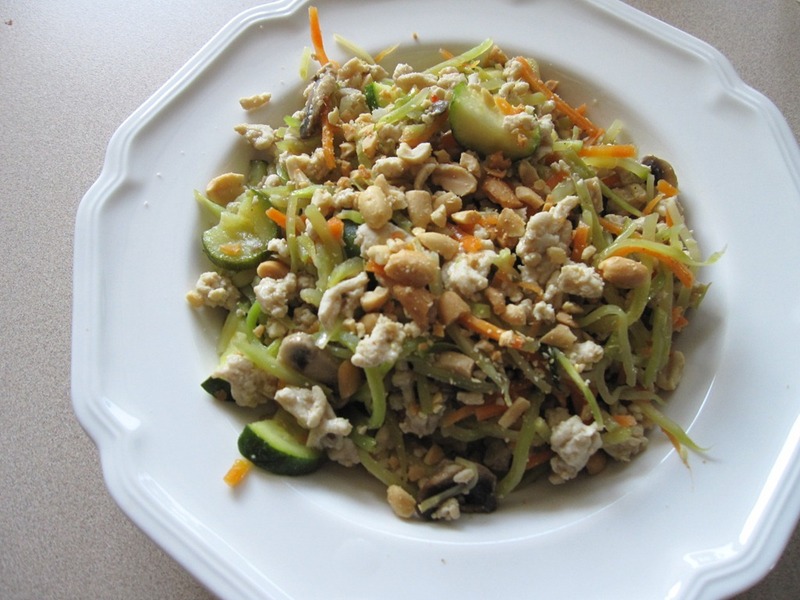 It turned out to be a great summer dish and a big hit in our household. Crushed peanuts are a perfect finishing touch. 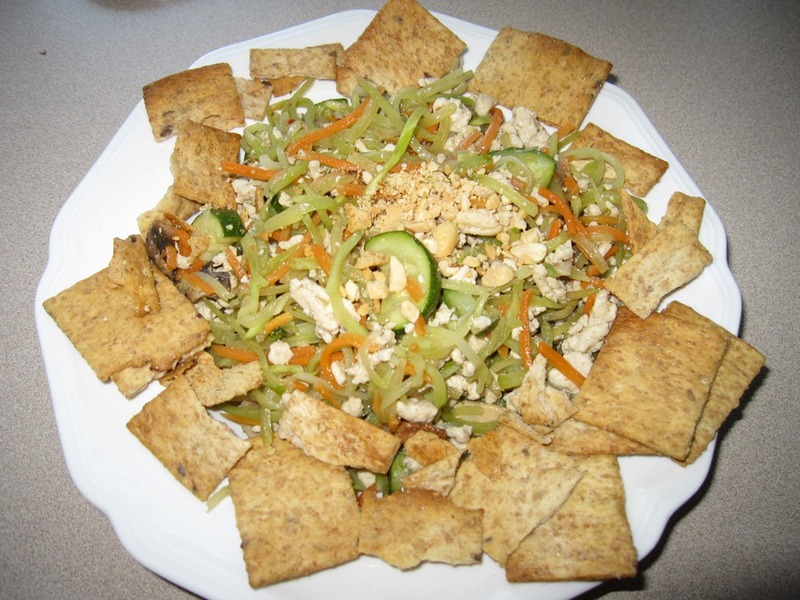 To Eric’s plate, I added a side of pita chips for extra carbs and crunch– I ate mine without to save on calories. 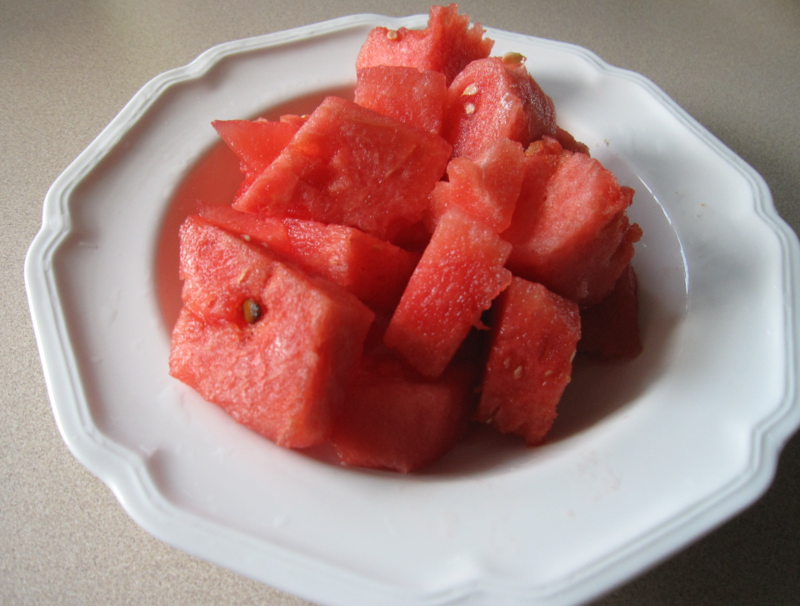 Watermelon completes our summer meal. Time to close down the kitchen! Someone asked if I actually close the door in the kitchen when I say this. It’s more of a figurative expression although we actually have a pocket door in our kitchen that I should probably start using. We usually just clean the dishes and turn off the lights. I then brush my teeth to signal to my brain I am done for the night.